If we have a new version of our application to test, we can publish it with a new route, like myapp-beta.apps.openshift.local. Then we run tests against it or let users try it at the “-beta” hostname. However, publishing the application with a new route and a new hostname can cause trouble. It may break Cross-Origin Resource Sharing (CORS) rules, complicating the handling of sessions and cookies, and it can introduce more Transport Layer Security (TLS) certificates to manage. It's probably easier to use one route with different paths to deliver requests to the beta version of the application. For example, the beta app could be reached at myapp.apps.openshift.local/beta. The pattern of one route per service is also awkward for APIs. APIs often follow a naming convention that segregates versions by URL path, for example myapi.apps.openshift.local/*v1*/health or myapi.apps.openshift.local/*v2*/health. It’s less common to see two versions of an API with two different hostnames, such as myapi-v1.apps.openshift.local/health and myapi-v2.apps.openshift.local/health. 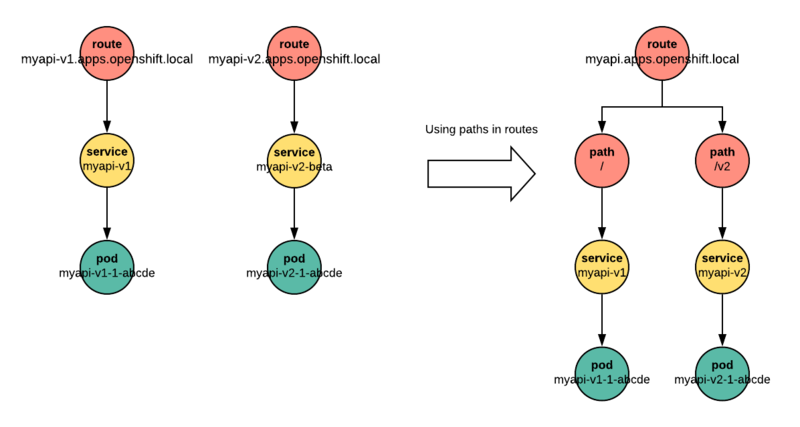 This post uses an example API server written in Node.js to show how you can deploy more than one version of an application beneath a single OpenShift route, by distinguishing each version with its own path. We use minishift to spin up a local OpenShift 3.9 (or later) cluster for testing. The local Class C network represents the internet, but restricts our name resolution to the local scope for demonstration purposes. Replace the “.local”-based hostnames in the examples according to your internet domain and environment when exposing services publicly. Through a bit of DNS magic outside the scope of this post, our base domain name for this example cluster will be 192.168.99.10.nip.io. Nodejs-echo is an echo server. It provides a trivial API: Send it a message and it sends the same message back. Nodejs-echo source is available on GitHub. /health Returns the API version as a demonstration of readiness. /echo/:msg Returns a duplicate of the received message msg. The first two variables control the IP and port on which the server listens. By default, it listens on the IP alias for all interfaces, 0.0.0.0, at port number 8080. These values don’t usually need adjustment when deploying the app on OpenShift. PREFIX, the third environment variable, sets a path prefix for every endpoint. With PREFIX=/api, for example, nodejs-echo will respond to requests at the endpoints /api/health and /api/echo. Now using project "echo" on server "https://192.168.99.10:8443". --> Found image 4cf5860 (3 weeks old) in image stream "openshift/nodejs" under tag "8" for "nodejs"
Build scheduled, use 'oc logs -f bc/api-v1' to track its progress. Meanwhile, development continues with improvements to our echo API. But we need to maintain compatibility for older clients that expect the v1 API. We could implement both versions in the same code branch, and manage the endpoints internally. But it can be easier to create a v2 branch where we implement the changes, and deploy it separately, without changing a single line of our frozen v1 branch. Change the version string in the /health endpoint. Add a deprecation message about the /echo endpoint. Implement a new method, /say, that has some error handling. --> Found image 4cf5860 (4 weeks old) in image stream "openshift/nodejs" under tag "8" for "nodejs"
Build scheduled, use 'oc logs -f bc/api-v2' to track its progress. Using paths to distinguish different routes is a useful option, and might not be as obvious to OpenShift users as dedicating a hostname to every service. This post has tried to show how to configure an application to make different versions available under different paths. We see that we have two pods for our application, each built from a different branch. Both are exposed at the same hostname, but distinguished by their path. Brand new to OpenShift? Check out the interactive tutorials complete with a hosted OpenShift environment at learn.openshift.com. Experienced application developer on the platform? Keep up to date and informed with theOpenShift documentation, or expand your OpenShift environment to Red Hat-hosted OpenShift Online or on-premise OpenShift Container Platform.